Ok, So this one really isn't all that funny. 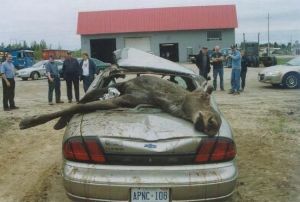 The woman driving the car was very lucky, but the moose wasn't. Moose are notorious for freezing in the middle of the road when hit with the headlights of an oncoming vehicle. A horse will do about the same thing. 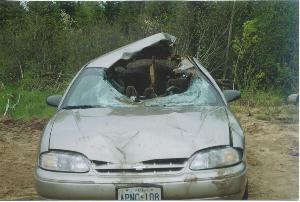 This car hit the moose near North Bay, Ontario. The lucky woman driver ended up with a broken wrist and needed a good bath and probably a change of underwear. Notice the hooves sticking out the front windshield!